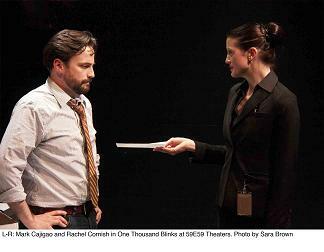 “Chinglish” is closing on the 29th. This gives you a couple of days to get over there and buy tickets. At first there is nothing ominous, just mild bickering on the other side of the motel room door. 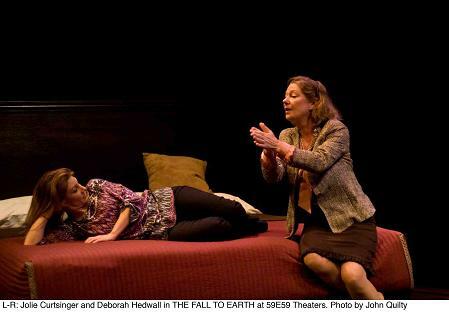 But as it progresses, Joel Drake Johnson’s “The Fall to Earth,” at 59E59 Theaters through February 5th in its New York City premiere, is darkly funny, even grisly at times. Rachel Browney (Jolie Curtsinger) and her mother Fay Schorsch (Deborah Hedwall) have come to this small town where her brother Kenny lived. 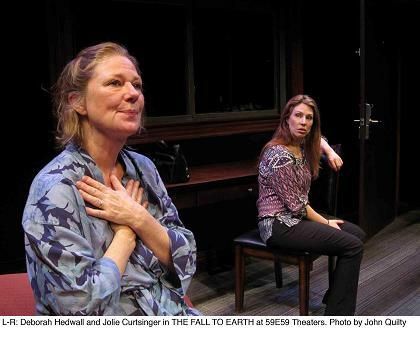 The trip brings them together at a difficult time, but as we find out in “The Fall To Earth” there probably were no easy times in the Schorsch household. How well did either mother or daughter know him? Terry reveals some secrets about Kenny that the women may have suspected, but it is clear that the entire family have been out of touch for a long time. 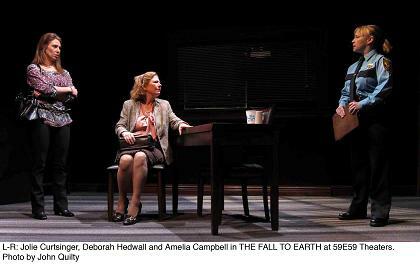 Keeping you on the edge of your seat and thoroughly engaged, “The Fall To Earth” takes many a surprise turn as it unfolds. “The Fall To Earth” also benefits from an excellent cast, and the deft direction of Joe Brancato, and the versatile set designs by James J. Fenton. Jolie Curtsinger (also a producing partner at InProximity Theatre Company which is a presenter of this production) plays a wary Rachel. Deborah Hedwall, as Fay, screeches, screams, rants, hectors, cajoles, chatters and whines in a brilliant arc of dysfunction. Rachel has her own reasons to be secretive and distrustful around Fay. For a schedule of performances, please visit www.59e59,org. 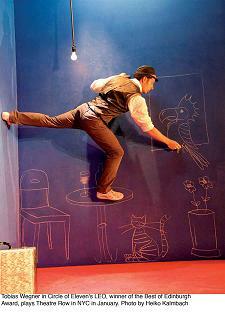 The Best of Edinburgh brings us "LEO"
Can something be both claustrophobic and celebratory? 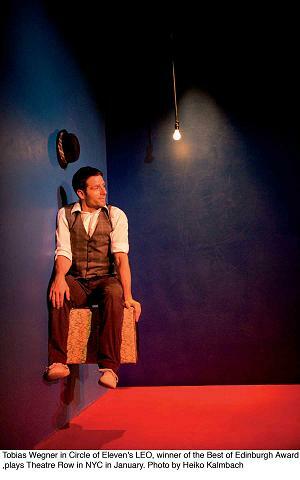 A man, a hat, and a suitcase shown live in a very small box-like room on stage and again on a screen so that the effect is a split set, are the makings of “LEO,” created by Circle of Eleven based on an idea and performed by Tobias Wegner. “LEO,” is the wordless theater piece The Carol Tambor Theatrical Foundation presents at the Clurman on Theatre Row through February 5th, as The Best of Edinburgh. 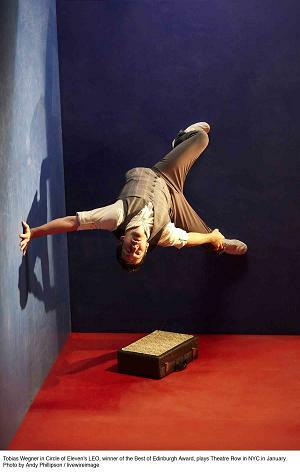 “LEO” offers a riff on Fred Astaire, Houdini and Laurel and Hardy. 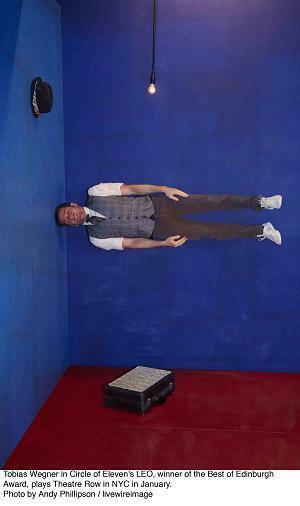 On the screen, the lounging character, is standing against a wall in his tiny room. In “LEO” the hero, whether upright or supine, literally climbs the walls, uses strength and agility to adapt to his surroundings, and ingenuity to ultimately escape. The concept– by Wegner–, design– set and lighting by Flavia Hevia and video by Heiko Kalmbach– are cleverly executed with whimsy and wit. “LEO” relies on the diverse cultural sensibility for Sinatra tunes and cartoons for its humor and charm. If it were a tad shorter it would be perfect. Stay Awake while "One Thousand Blinks" experiments with "micro sleep"
How much more could you accomplish if you didn’t sleep? A truly dedicated worker might be as productive as Morgan (Mark Cajigao) whose Sisyphesian task it is to translate a book on an unfamiliar subject in a language he does not know. 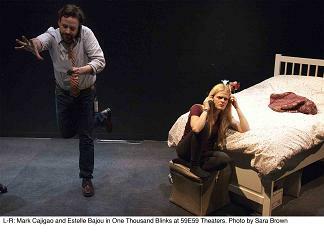 In “One Thousand Blinks,” at 59E59 Theaters through January 29th, an odd scientist named Dr. Luk (Rachel Cornish) imposes an experiment in “Micro Sleep” on an unwitting Morgan. Hired in a far away land to teach a class that is indefinitely postponed, Morgan is instead offered the opportunity to make a lot more money working non-stop in a tiny room. The money is tempting as is the idea of hard work. You see, Morgan feels like a slacker for having his girlfriend, Jenny (Estelle Bajou), support him. Jenny has sleep issues of her own, it turns out, mostly in the form of nightmares that are exploited by her ex-boyfriend, Bram (Drew Hirshfield). Unlike Morgan, Bram is successful and accomplished. “One Thousand Blinks” is an engaging and spooky undertaking. 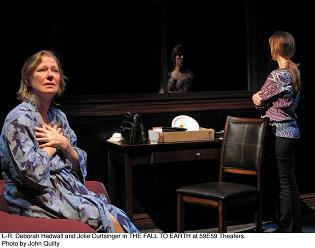 Playwright Nick Starr keeps the suspense and mystery without letting strangeness become the point. Mark Cajigao is endearing as Morgan struggling to be diligent. Rachel Cornish is serenely funny as her robotic Dr. Luk calmly terrorizes the hapless Morgan. 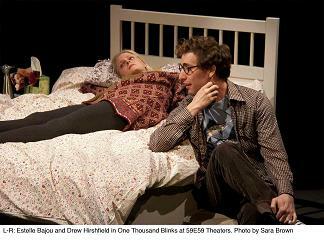 Drew Hirshfield’s Bram is smarmy and oily, and Estelle Bajou portrays Jenny as a fierce victim. With a cast dedicated to making everything appear normal, “One Thousand Blinks” triumphs as a highly askew romantic comedy.